Welcome To Our Guide To Those Nasty Guinea Pig Foods To Avoid. Find Out What Not To Feed Guinea Pigs, And Healthier Alternatives To Give Your Pet! We all want our beloved pets to live long, healthy lives. But we also want to treat them to yummy foods. And sometimes, these two desires can conflict with each other! There are certain foods that guinea pigs should not eat – which is what we’ll go over today. We cover guinea pig nutrition in greater detail in our guinea pig food guide. 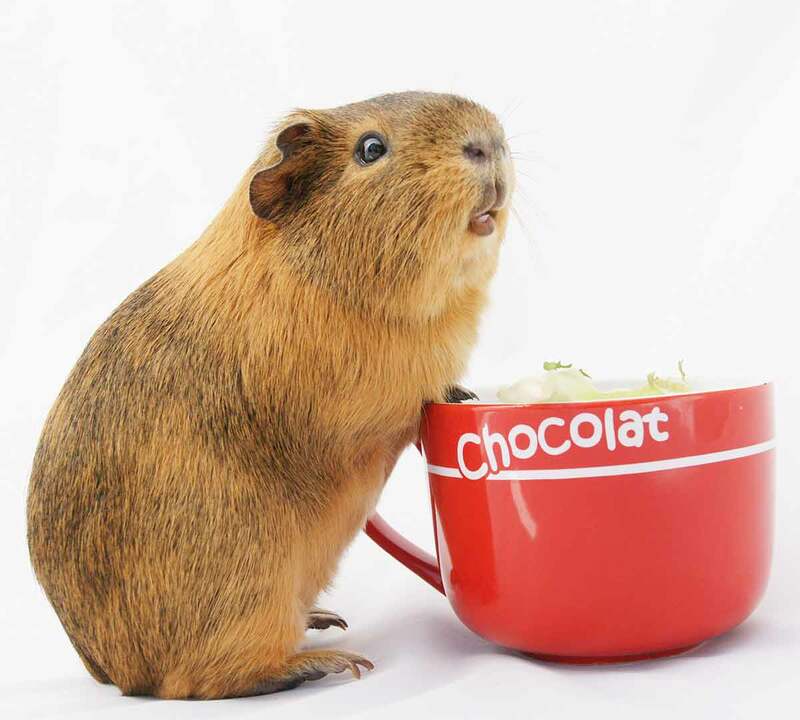 But for now, let’s focus on guinea pig foods to avoid to help keep your furry friend healthy and happy! What can guinea pigs not eat? Nuts, seeds and grains are commonly found in cheaper small pet treats and food mixes. However, that doesn’t mean that they are healthy for guinea pigs! These are on the list of foods not to feed guinea pigs. This is mainly because seeds and nuts are very high in calories and fat. Feeding your pig high-fat foods can lead to weight gain, heart health issues and other health concerns. Some seeds can also be a choking hazard for guineas, adding another reason to avoid them. Anything that’s sugary and sweet should fall on the list of foods not to feed guinea pigs. Sugar can cause unhealthy spikes in blood sugar, and is also a source of unnecessary empty calories. The only exception is fresh fruit, which is fine to feed guineas in moderation. Highly processed foods like breakfast cereals, breads, etc. are good examples of guinea pig foods not to feed your beloved pet. These are usually full of added sugars, preservatives and other unhealthy ingredients. They may also be difficult for guinea pigs to digest. Guinea pigs are lactose intolerant. This means that they cannot digest lactose, a sugar found in milk. If dairy is consumed, guinea pigs will typically experience gas and diarrhea. Thus, guinea pigs should not be fed anything containing dairy. That means no milk, yogurt, cheese, etc. Also, watch for hidden sources of dairy in treats and other foods you wouldn’t necessarily consider dairy-based. While most vegetables are safe for guineas, some are not. What vegetables can guinea pigs not eat? Onions, beans, peas, corn, beetroot, peppers, potatoes, tomato, tomatillo, spinach, garlic, and rhubarb are guinea pig foods you may wish to avoid. Also, any pickled or brined vegetables, including canned olives and the like, should be avoided. Some of these foods, like rhubarb and potato, can be poisonous to guineas, while others are just difficult to digest and should be fed very infrequently. To be safe, avoid all the foods on this list. Always make sure vegetables are fresh and raw, not cooked. Additionally, clover and alfalfa hay are not ideal, as they are too high in calcium and protein. Some plants can be poisonous or irritating for guineas. This includes autumn crocus, bishop’s weed, buttercup, cherry trees, daffodil, delphinium, ivy, poinsettia, foxglove, garland flower, lily, hydrangea, holly, horseradish, iris, jasmine, lilac, mushrooms, water hemlock, and more. To be safe, simply avoid any plants or herbs that you have any doubt or concern about. Also, if you let your guinea pig roam outside (which should only be done supervised and in an enclosed area), be aware of any plants that they could potentially eat. Ideally, keep them confined in an area with nothing but grass. Anything that’s high in fat should be added to your list of guinea pig foods to avoid. High-fat foods can contribute to the risk of atherosclerosis, liver damage and more. So, high-fat foods like avocados, nuts, seeds, coconut, etc. should be avoided. What Should Guinea Pigs Eat? 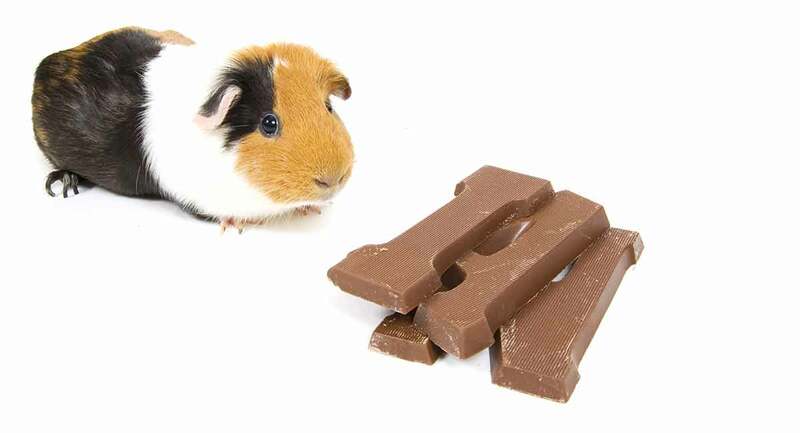 For details on an ideal guinea pig diet, see our full guide. 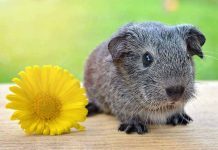 In summary, the bulk of your guinea’s diet should consist of grass or grass hay, leafy green vegetables, high quality guinea pig pellets, and a good dietary source of vitamin C.
As for treats beyond their regular diet, there are some healthful options. Keep in mind that while most fruits are fine to feed guinea pigs, it should always be done in moderation due to the high sugar content. Also, guinea pigs should have constant access to fresh, clean water, which should be changed out regularly. 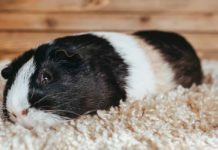 If you follow these tips and avoid these guinea pig foods, your pet should stay happy and healthy for a long time to come! National Research Council (US) Subcommittee on Laboratory Animal Nutrition (1995). Nutrient Requirements of Laboratory Animals: Fourth Revised Edition. Washington (DC): National Academies Press. Ye, P. et al (2013). High fat diets and pathology in the guinea pig. Biochimica et Biophysica Acta (BBA), 1832(2). Ottawa Humane Society, A quick guide to guinea pigs. 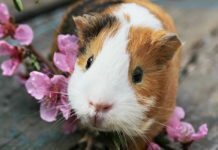 Royal Society for the Prevention of Cruelty to Animals, What should I feed my guinea pig?